Faversham Voices was set up in 2015 as a joint venture between Faversham Music Club and Faversham Town Council. Faversham Voices is a non-auditioned community choir open to singers of all ages. The emphasis is on having fun and improving health and well-being. We welcome singers of all backgrounds from sing-in-the-shower enthusiasts to seasoned choral singers. Faversham Voices sing an enormously wide range of music from medieval songs to newly written pieces. You do not have to read music but there will be opportunities to do so, or to start to learn if you wish. We use a website with support materials to help those who want to get to grips with the music in the privacy of their own home! Faversham Voices rehearse on Thursday evenings from 7 – 9pm. We get together for specific projects two or three times a year. Fun, accessibility and quality are at the heart of what we do and we work with top class musicians and performers. Faversham Voices costs £4 per rehearsal. We run a ‘pay what you can afford’ scheme for those eligible for concessions. 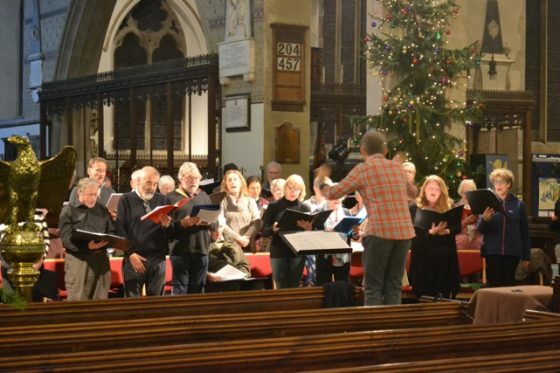 The choir is managed by Faversham Music Club, a charity promoting live music making in the town. Faversham Voices is directed by David Knotts who has 20 years experience in working with singers of all ages. David succeeded Gareth Malone as music director for the London Symphony Orchestra’s flagship Community Choir. He now runs a choir at HSBC in Canary Wharf and works with choirs of young voices at the Royal Academy of Music.